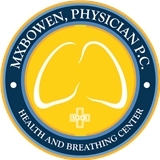 MXBowen, Physician P.C. (New York) - Book Appointment Online! Full service Pulmonary and Internal Medicine practice within a multispecialty collabrative environment. The office is state of the art with fully Electronic Medical Records and communiction standards that meet current and future Federal mandates to secure your health information. The location is easily accessible by mass transit and walk-ins are welcomed. The aim is to make the whole patient experience as "easy" as possible. Dr. Bowen was extremely thorough in his examination and very comprehensive and clear with his explanations. His staff was courteous and professional, as well as very helpful. I would recommend his practice highly.